Amid Talk Of Tariffs, What Happens To Companies That Straddle The Border? President Trump has called NAFTA a "catastrophe" and threatened to impose a border tax on Mexican imports. How does that impact produce companies with operations on both sides of the border? Rows of greenhouses at Wholesum Harvest's farm near the tiny town of Los Janos in Sonora, Mexico. "We expect to have access to mangoes and passion fruit and tomatoes in the middle of February in Arctic regions," explains Jessie Gunn, a spokeswoman for Wholesum Harvest — an organic, Fair Trade USA-certified produce company with operations in both Arizona and Mexico. The grower sells tomatoes, bell peppers, cucumbers, eggplant, zucchini and more to Costco, Whole Foods, Safeway, and Albertsons and other U.S. grocery stores. President Trump's repeated campaign threats to pull out of NAFTA and impose a tax on Mexican imports have caused jitters for Wholesum and other businesses on both sides of the U.S.-Mexico border. We head south to check out one of Wholesum's Mexican operations. 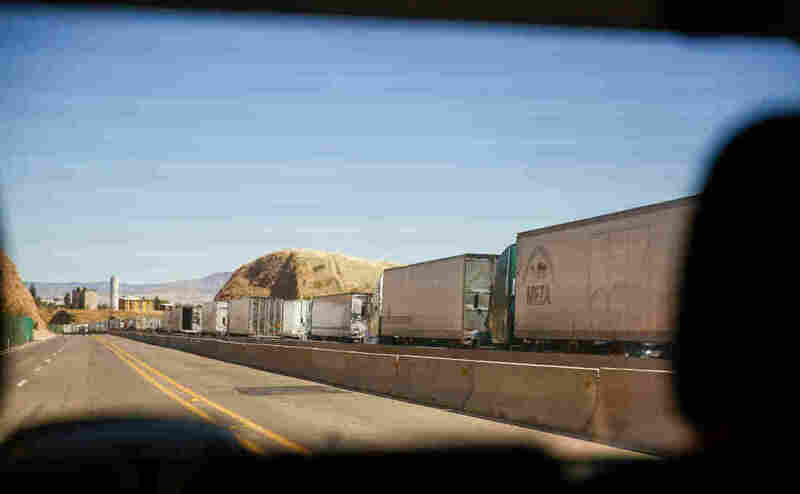 As we drive across the Nogales border, we pass dozens of 18-wheelers, lined up to cross into the U.S.
"These are all produce trucks, every single one of 'em," says Gunn. She reads off the names of the trucking companies as we drive by: "Agrofresa. CFI — very common transporter. Sí Señor. Agrofresa again ..."
Nogales, Ariz., is the No. 1 port of entry for Mexican produce coming into the U.S.: A whopping 6.3 billion pounds of fresh produce crossed the border there during the 2015-16 season. That's more than 19 pounds per American consumer. Going back the other way? Lots of U.S. corn and soybeans. If Trump were to impose a tariff on Mexican goods, Gunn says, she has no doubt that would ignite a full-on trade war. Tax for tax. "It is the law of the universe," she says. "Equal and opposite force. No country with any common sense would allow a tariff to be put on their exports without meeting that with an equitable tariff of their own." About 30 miles south of the border, we reach the tiny town of Los Janos and pull into Wholesum Harvest's organic farm, with greenhouses stretching as far as the eye can see. 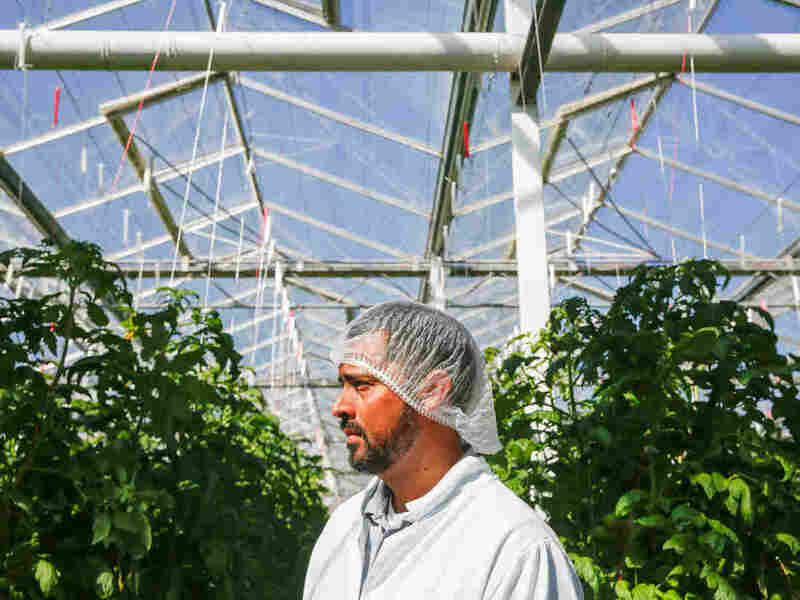 Our car tires are hosed down with disinfectant to keep us from spreading disease and pests, and — after we disinfect ourselves and slip into protective gear — we enter one of the greenhouses to see what's growing. 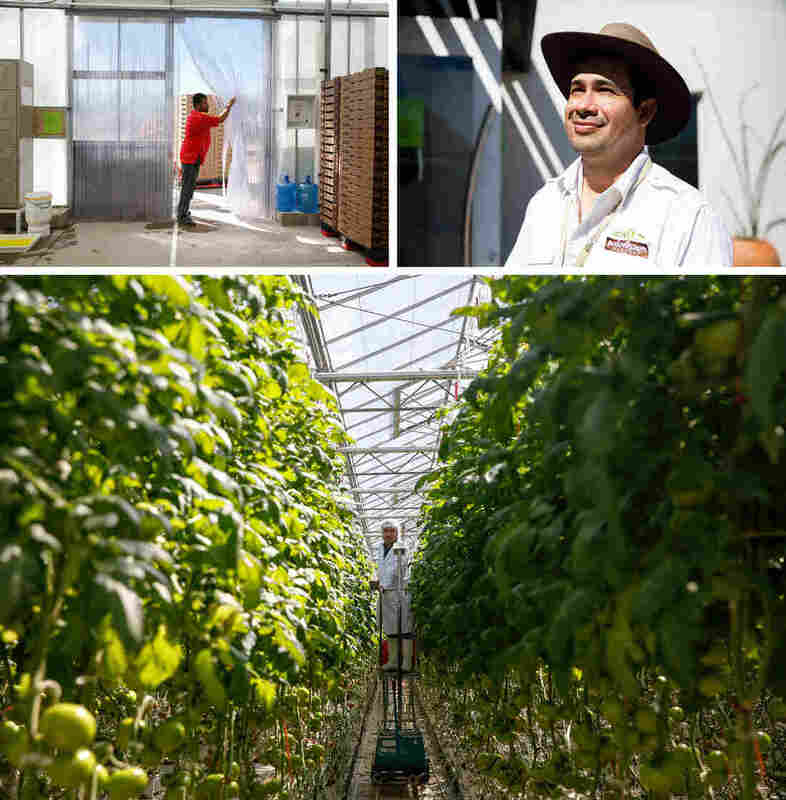 Top left: The entrance to the Wholesum Foods greenhouse in Mexico. Top right: Francisco Landell, the general manager of this Wholesum farm, has thought a lot about what it would mean if NAFTA were to disappear. Bottom: The greenhouse is a steamy, verdant tomato jungle, holding about two football fields' worth of tomato plants that shoot some 10 feet up into the air. It's a steamy, verdant tomato jungle: about two football fields' worth of tomato plants, shooting some 10 feet up into the air. The plants grow out of 6-inch pots, like the ones you might buy at a garden center, but from those small bases the tomato vines turn gargantuan, each about 80 feet long, twisting in a labyrinth. Scenes from inside greenhouse No. 2 at Wholesum Farms Sonora. Francisco Landell, the general manager of this farm, has thought a lot about what it would mean if NAFTA were to disappear. "I think we will lose a lot of jobs," he says, "and I think it will be disastrous." He wonders, is it all just tough talk from Donald Trump? Or is the president really serious about pulling out of NAFTA and imposing a border tax on Mexican goods? 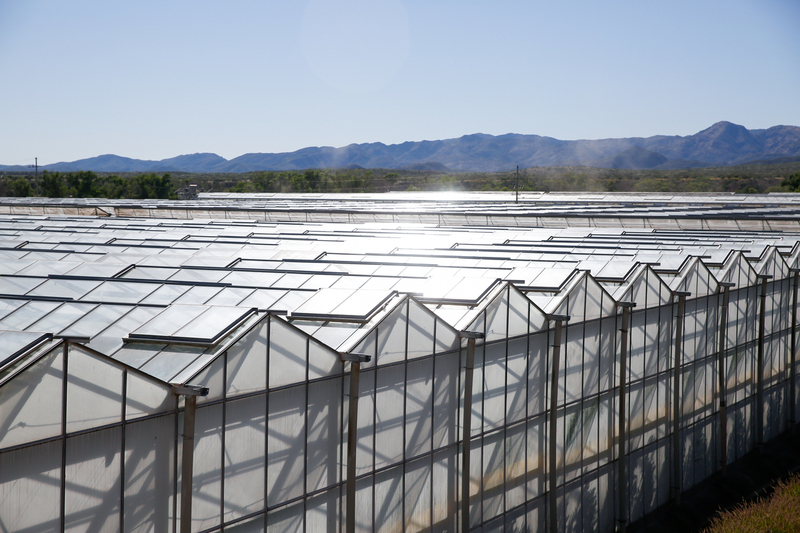 Carlos Gonzalez helps run the greenhouse growing operations at Wholesum Farms Sonora, in Mexico. "We are concerned," Landell says. "Right now we're not making any investment plans or any expansion plans, because you don't know what will happen next year. Everything is on hold." By U.S. standards, the workers at Wholesum Harvest don't make much — about $10 a day. But they also get free housing, along with free medical, dental and child care. Because this is a fair-trade company, premiums also go back to the community. With those funds, it has built a soccer field and a tortilleria, improved local public schools and is building a community center. Landell says his workers tell him that with those benefits, they're not as tempted to illegally cross the border: "If they can make a decent living and put food on the table of their child [by] working in Mexico, they will stay in Mexico." Without the guarantee of free trade, it's hard to know how stable these jobs would be. Still, Landell is dreaming of a bright future. His hope is that this farm's success will propel the next generation to better things: "My dream is to go into a bank, ask for a loan for the company, and they say, 'Francisco, you really don't recognize me? I used to live there by the farm! My dad used to pick tomatoes!' "
If that tomato picker's kid ends up being the banker lending him money, Landell will be a happy man. 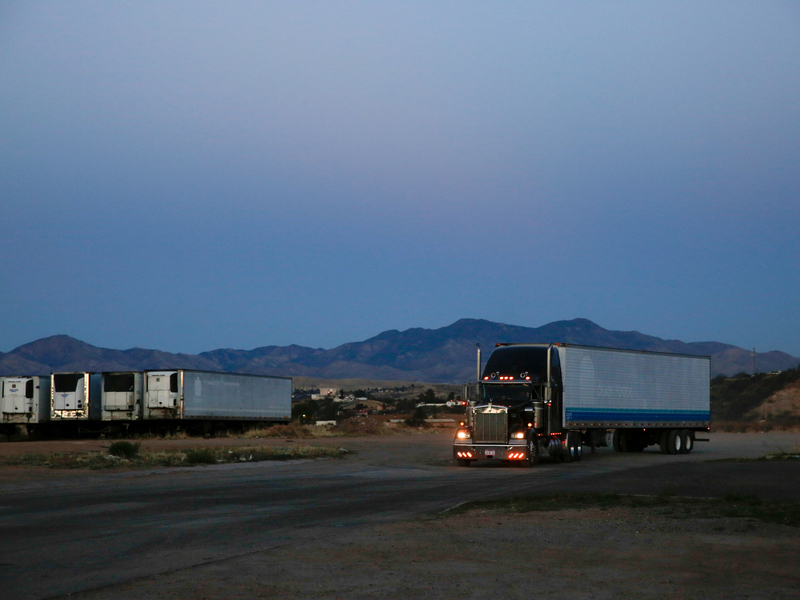 We leave the farm, and head north, back toward Arizona, alongside a fleet of produce trucks. 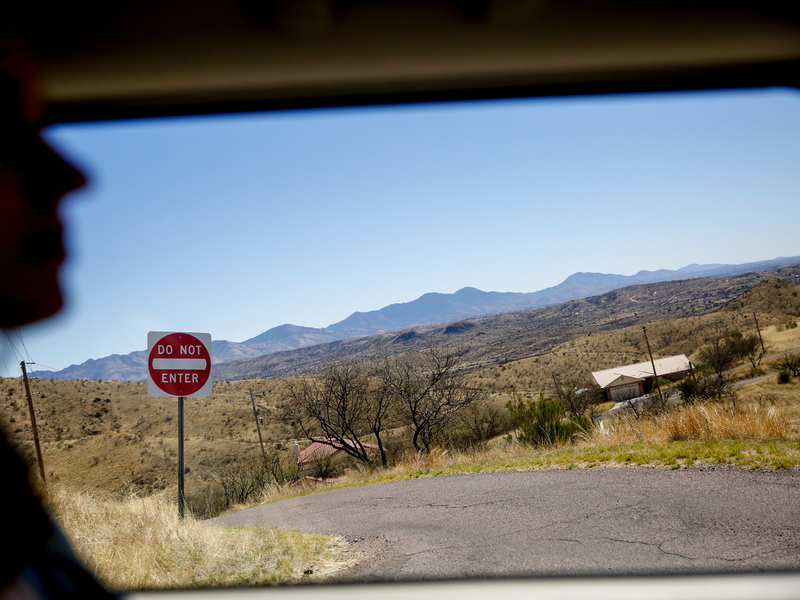 Looking out at the Arizona landscape near the U.S.-Mexico border near Nogales, Ariz. A whopping 6.3 billion pounds of fresh produce crossed the border at Nogales during the 2015-16 season. Wholesum Harvest's headquarters is back on the U.S. side of Nogales. Next to the corporate offices is a warehouse stacked to the rafters with cartons of cucumbers, squash, peppers and — more than anything else — tomatoes: cherry tomatoes, grape tomatoes, Roma tomatoes, beefsteaks and TOVs (tomatoes on the vine, for the uninitiated). 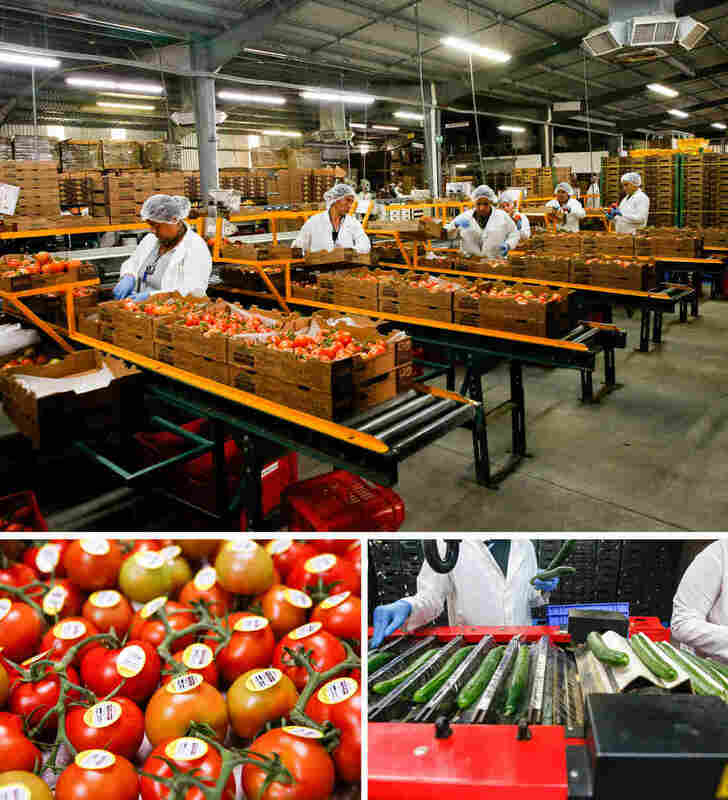 There's a small packing house — known as "repack" — where workers have a second opportunity to sort through the produce, inspecting for quality, checking the labeling and weighing the cartons. By the time we reach the warehouse it's dark out, but the Wholesum team is still hard at work — packing trucks for delivery. The process is nearly complete as we watch 18-wheelers pull off into the night, ferrying tons of fresh Mexican produce to a supermarket near you. Trucks carrying produce head back across the U.S. border from Nogales. This story was produced by Anjuli Sastry. The "Our Land" series is produced by Elissa Nadworny.